I'm very honored to present you another great interview this Monday. After Donald Kevilus from Four Dog Stove saw my first video of the Bushcooker LT 2 he range me up and gave me some valuable tips, resulting in my second try which was much better. We have chatted a couple of times now, and I have learned a lot in our conversations and emails. Don is a very knowledgeable man if it comes to outdoor and bushcraft skills, and thus I am very proud to present you this interview! 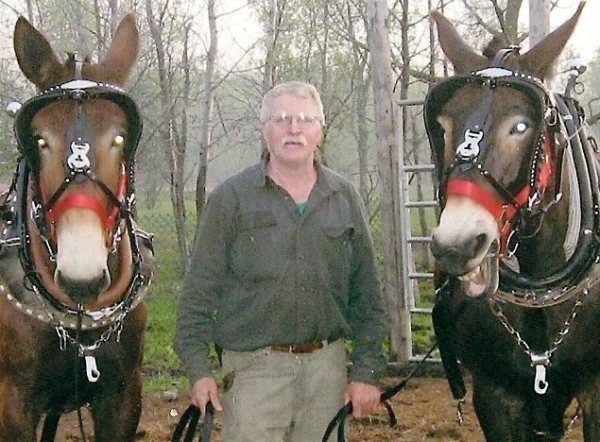 Don with his work mules "Bill" and "Big Jake". Don, please briefly introduce yourself and tell us who you are. Since when are you backpacking, and how did you start? How often are you out backpacking nowadays? I'm a true Minnesota boy, born and raised. I was given the chance to spend a great deal of my childhood roaming and playing in the forest and fields. My people on both sides of my family where farmers and woodsman. So I learned my love of the land and a reference for nature from them. They were people of the land and had all come from hard scrabble, so from them I learned strong bush skills and how to make your own gear and that you never buy what you can do for yourself. My father was my greatest mentor, he taught me a love and respect for nature and how to do the most with the least. To him going to the woods was his place of worship. He never took more then he needed and always left more then he took. His idea of camping was a coffee can to cook in, a wool blanket and a piece of canvas using a old burlap feed sack for a backpack. He would always challenge himself how to do more with less. We would place ourself in the lap of mother nature and relish in it's glory. He also taught me from a young age to be a true tinker, making things and modifying items to make them more useful for our needs. I don't think he ever bought anything that he didn't modify. I now I live in central Minnesota with the love of my life, my wife Roxanne, life partner of 25 years. We have 40 aces woods and pasture where we grow a large garden, have chickens, guinea fowl and saddle and work mules that I use for my farming and logging. We are not a cottage industry, where a back shed industry where the wife works with me to hand craft the stoves we use and sell. We a very lucky that we are able to live where we work and play. Roxanne Kevilus working on ti "Bushcooker Lt's" with titanium tent stoves to the right in the shop. I would say I'm more a lightweight/ bushcraft backpacker. I also like to go by mule, kayak or pull a pulk when I warm camp in winter. But by far my favorite method of travel in nature is with the bare minuim carried on my back. The more you know the less you carry. Weight is an issue but durability is also important. Having worked mules most my life and living hard I have found that items fail when they're under stress. In my life that gets you damaged or makes for an unpleasant experience at best. I would rather carry a axe in winter and a strong durable "puukko" knife anytime I go to the bush knowing I can meet my needs for warmth and shelter. Also, if I buy or make it I only have to do it once. Technology never makes up for skill. My base weight would be 7 lbs 9 oz. Four Dog Stove sells a lot of different gear, from the big Four Dog Stove over Titanium Portable Stoves to the Bushcooker Lt, as well as some Bush Gear. Can you tell us a little bit about the beginnings of Four Dog Stove, the birth of the Bushcooker Lt, and how it developed over time? I wanted the wife to go out with me in the winter months and with temps that go down to -35°F she wanted heat. So having made larger stoves to heat the house and shop before I made one for a tent. I wanted something durable that a person could sleep with loved ones and feel safe. That was the start of Four Dog Stove Company 22 years ago. Over the years from feedback from outfitters, trappers, hunters, guides and wilderness travelers there was a need for a stove that was light and durable that some where using for up to 3 months in the winter months at temputures down to -45 degrees for weeks on end. So in 1999 I started working making trails stoves out of titanium with great success because it gave the user a stove that was lighter, durable and that would last a life time and not fail. As you learned at -30 when failing is not an option. They have been in use now for eleven years with no failure to date. From my experience as a youth, making hobo stoves with my dad from cans (who did ride the rails in the 1930's) and being a student of refugee stoves in Africa I started to play with different designs using titanium. I started selling some in 2002 but became discouraged because of the the poor fire skills of most people. Up to that point most of my customer base had good basic outdoor skills so I had not experienced that before. From that point on I just sold to people that had good skills. Then last June I developed the "Bushcooker LT titanium" that allowed the user to use alcohol, esbit and any bio-mass with the same stove at a weight never before seen. The beauty of the Bushcooker Lt is, it allows the user to use the fuels at the same time. So it makes a little bit of alcohol or Esbit in to a lot by using wood or charcoal. No other stove at this time offers the simplicity, durability, flexibility that the Bushcooker Lt offers. Use the alcohol and Esbit as training wheels, till the user learns good fire skills. All my stoves are made in my shop, nothing is out sourced. They are made with help from my helper Jeff Bruske, my wife Roxanne and myself. We are not brokers, we use what we make and sell what we make. Roxanne and Jeff Bruski working in the shop. Combined Jeff and Don have over 75 years outdoor experience and 50 years metal working skills. Don, we love to be let in on the work-in-progress stuff! Can you let us know a tiny bit on what kind of new products you're working at the moment? I'm working on different pot and windscreen/ heat exchangers for the Bushcookers for long-range wilderness travel. The stoves are burning as efficient as possible now. What we have to work at is transferring that energy to what is being heated or cooked. Also I'm starting to do more instruction and hands-on workshops. I'm into the fifth year of doing my "TINCAN BUSHCOOKER" workshop where the students hand craft there own gasifiction wood stove from paint cans using basic hand tools. At the end they all burn and learn how to use the stove bringing a litre of water to a roiling boil in 8-10 minutes with 3 1/2 oz of twigs. I will be posting directions on my web sight in the near future for people to do it themselves. Bushcooker LT I + Bushcooker LT II with windscreen heat exchangers and Evernew 0,75 l and 1,0 l pasta pots. How works the R&D at Four Dog Stove, do you have a need yourself that you try to fix, or do some of your clients inspire you for new products or ask you for solutions to their problems? I have always listened to my clients and their needs. I feel very lucky to have been able to learn from them and provide them solutions for their cooking and heating needs in some of the coldest places on earth. What is the most sold piece of gear from Four Dog Stove? Also, where do your customer come from? The flagship of Four Dog Stove would be my Four Dog Model steel stove. They are primarily sold to the USA western hunting market where 25% of the hunters are still packing in with horses and mules. (plus a Exped 7 Downmat in winter), as well as a Hilleberg Bivanorak. From our telephone calls I know that you know Mors Kochanski, and meet him every once in a while. I consider you very skilled and informed when it comes to bush craft, can you tell me and my readers a few of these skills which you think would be most essential to know when going out? After my father Mors would be my Guru. I know of no other person more knowledgeable of the Boreal forest, my home, than Mors. His knowledge and ability to teach others no matter their age or skill level about the wilderness is amazing. I feel honored and humbled to know and have sponsored courses done by Mors and to say he is my friend. I would say after 50 years of sleeping in the bush the most important skills to have would be clothing, fire and knife skills; and going to gain the knowledge necessary to be become truly at ease in the arms of mother nature, no matter what the season or the weather. When and where was your last longer backpacking trip, and what was your baseweight? Are you planning to get out for a trip soon, and enjoy the winter season in Minnesota? 3-4 days when it gets the coldest in Jan or Feb to test gear and concepts. If it works at 30 below it works anytime. Titanium tent stoves being pre-burned for shipment to the Netherlands to be used in Swedish made Tentipi tents. I think most outdoor camping is on the decline because people have found easier ways to entertain themselves, with things which take less effort and skill. It takes time and willingness to learn how to enjoy the outdoors on its terms and not to endure. I do think there will always be a core group with a passion that will follow their heart. But main stream no. They will buy the clothes and maybe some gear but never take the time to develop their skills which they will need to truly enjoy the woods. Don, I thank you for taking the time to answer my questions. Is there something you would like to add? I once again I would like thank you for the chance to share with you and others a little bit about myself and Four Dog Stove Co. I hope that I'm able with what I make and the knowledge I can share, I will help people to get out into nature and be able to enjoy it with family and friends. If in a small way I help that happen I have done something right. So thank you and may you always find a warm meal and a dry bed.